Please check if you would like this book with a signed original pencil drawing of a grouse feather on the title page. Hunting, like our society as a whole, has seen major changes in the past century. From where and what we hunt, to changes in arms, ammo, and techniques, the sport today is vastly different than it was at the turn of the century. Though all these changes have undeniably changed the way we hunt, that’s not what this book is about. This book is about tradition. For most of the millions of Americans who go afield in pursuit of game in the 1990’s, a hunt is about so much more than the act of hunting. It’s also about connecting to the land, bonding with your hunting companions, and respecting the spirit of the chase. The core of the hunt, the very reasons that people go afield is the same today as it was in 1900. Tradition. A celebration of our hunting heritage, 100 Years of Hunting is a striking collection of stories and artwork. 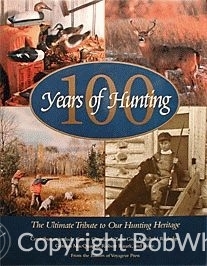 It includes compelling writing about hunting game – from the ever popular whitetail to mule deer, elk, grizzly bear, bighorn sheep, grouse, ducks, pheasant, and more – from the past 100 years. The engaging narratives are from such legends as Grover Cleveland, Zane Grey, Archibald Rutledge, Gordon MacQuarrie, Patrick F. McManus, Ernest Heningway, and Robert Ruark. These tales of hunting are paired with great artwork, including outstanding wildlife photography, hunting collectibles, sporting paintings, period ads, and historical images for a collection that’s right on target as a magnificent tribute to our hunting tradition.